Vintage funny cars are my favorite drag machines to watch. Not many around anymore. But this site was for all those aficionados who craved news about those incredible "funny cars'. John Powers will be attending next months Goodguys Nitro Nationals at Pomona. 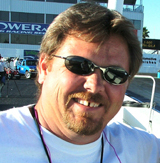 It was mis reported here yesterday that Powers will still completing his licensing requirements, when in fact he completed his licensing at Tucson during the Old Tucson Dragway Reunion. The Funny Car Fever Event in Sacramento this weekend is still being held. Apparently there is an elaborate hoax being perpetrated by unknown individuals saying the event is canceled. This is not true. There is going to be 4 Nostalgia Funny Cars in attendance running this weekend. Dan Horan, Dennis La Charite, Mike Savage, and Kris Krabill will be attending. We will have updates this weekend. John Powers and his lawyers have succesfully petitioned the Goodguys Sanctioning Body to allow his controversial floppers to run in the Goodguys Series this year. Powers is currently in the licensing process and it is unsure at this time if he will be at the Nitro Nationals in Pomona next month. 4/20 - Mike Adams Temporarily Parking His Racing Operation. Mike Adams has decided to park his existing Nostalgia Funny Car operation temporarily, effective immediately. Adams is currently seeking to upgrade to a new chassis/body to campaign in Goodguys competition.. Adams current Nostalgia Funny Car operation, less motor, is for sale. This is the same flopper that Adams drove to a 6.08 in 2004 at the Funny Car Nationals. Anyone interested in purchasing Adams current flopper can contact 480-759-1232 for more information. Serious inquiries only. 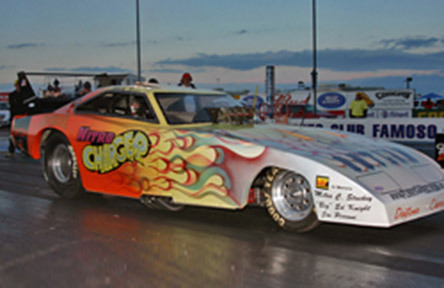 4/13 - NFCN's Retroview With Mark Stuckey and Steve Knight, Owner and Crew Chief Of The "Nitro Charger". NFCN: What are your backgrounds in drag racing? Stuckey: I spectated a lot. I was introduced in 68, a friend of my dads gave him a couple of boxes of hot rod magazines from 61 to 68. I started going to various So Cal tracks in 69 or 70 and thought it was too expensive to get any further involved. I was smarter then I guess. responsible for exposing me to Drag Racing at an early age. He was a racer, had a lot of racing friends & I was his racer brat. Growing up around these guys everything was racing. I have drag raced everything from dry ice rockets, belt sanders, Hotwheels, sand rails, slot cars, VWs, Top Fuel Dragsters, my wife & now Fuel Funny Cars over the years. I'm sure I am missing something here but this gives you a pretty good idea. If it had wheels & a motor, a race always seemed to break out! NFCN: How did you guys end up working together? Knight: I was working at Rex Hutchison's when Mark & I first met. At the time Mark was struggling, trying to make heads or tails of what he had & what to do with it. After about 4 or 5 months of seeing his stuff 1 part at a time I had gone from "The tall guy" to this guy named Stephen. It was about this time I offered to help Mark out & the rest is history. Stuckey: Stephen pretty much answered this one. I knew what I wanted to do, just didn't know how to get it done. NFCN: You guys had your first outing with the "Nitro Charger" at the canceled March Meet and were able to qualify with Jeff Utterback behind the butterflies. Tell us a little bit about your weekend and the first time on the track with the "Nitro Charger". Stuckey: Well, we had been working on the car for the better part of a year. I put Stephen under a lot of pressure the last month because I knew this meet would be a big step for the NFC's as a group. Sixteen just sounded good. I had to overcome a lot of paranoid delusions about someone else driving my car, after all we were busting our tail so I could drive the thing. Reality is reality and of all the guys wanting to drive, I felt Jeff would be the best. Jeff did us good and I think everyone else kept stride too. Knight: If it had not been for the rain & the week delay you would Not have seen the Nitro Charger at the MM. We tried to fire it on Wednesday and had some problems. Got it lit on Thursday evening, got it loaded up, stopped & picked up our Tee Shirts, and were headed south by 11:30. Mr. Utterback didn't know he was going to have a ride till late Thursday night. Being the Fuel Driving Kinda Gentleman that he is, he really stepped up & hit it out of the park for us. I really look forward to working with him at some point in the future. It's people like Jeff that really made us look pretty good!! All in all I would give the Black Sheep Squadron a B. To get an A we would have had to win the event. Personally I was over the top happy just getting to the stripe on our first pass on the car. To have Jeff put the Nitro Charger 5th or 6th out of 16 or 17 cars on the first pass?. WOW, I?m amazed? Kinda like a dream. Jeff is amazing, #1 in my book, hands down. NFCN: What events will you be competing at this year? NFCN: What are the plans currently for licensing? Stuckey: If the weather co operates I will make a few licensing passes later this month. Knight: At this time, the plan is to focus on getting Mark licensed & finding a marketing partner to keep things going. It?s about 5 to 7 K per weekend to do it right. Mark & I are just ordinary working guys so our biggest battle will be finding marketing partners & the $$$$$ necessary to support this monster. NFCN: Will Jeff Utterback be back in the seat of the Nitro Charger this year? NFCN: You have kept the original paint on the charger since you bought it from Rocky Pirrone. Any plans on changing the paint scheme? Stuckey: The paint scheme is part of what makes this car so unique. I like it but for the right deal I am quite flexible. Knight: It looks great, why mess with it? NFCN: What are your thoughts on the Goodguys handling of the rainout and subsequent cancellation of the March Meet? Stuckey: Its unfortunate things happened the way they did. Nobody can predict weather and when the track turned belly up the event needed to be called. As far as pay out - it would have been nice to re coup some of the weekend cost but that won't keep me from coming back. Knight: I'm not a promoter so I really do not have a qualified opinion about it. Sure we wanted to race just like everyone else, but not bad enough to see anyone or thing get hurt. For us it was a success & we are now moving forward, down the critical path. I can tell you this; I'm sure glad that I didn't have to make some of the decisions the Goodguys had to make. At that level someone is always gona be mad with what's decided. It is impossible to please everyone, all the time & life isn't always fair. NFCN: Are there any rules that need to be changed or added in your opinion for the NFC Class in Goodguys competition? Knight: Yes sir there is, the next New Rule should read, The Next New Rule is NO NEW RULES, for at least 2 years. Let it play out for a few years before we make any more changes. NFCN: What is your opinion on the fuel war currently being waged between Pro Nitro and Pro Racing Fuels? Stuckey: Part of doing business. Knight: I wouldn't call it a war, nobody's died yet. I like Jim & Dale, don't know Don. From my front porch it's pretty handy, I can buy right here in town, buy it at the track, or have it shipped anywhere if needed. What is there to complain about? We have a free market economy, isn't it great!! One of my regrets was not getting to speak with Dale in Bakersfield as he was bringing us mix. NFCN: Is there anything else you would like to add? Stuckey: I would like to thank everyone Jeff Utterback: seasoned professional driver, Stephen Knight: up and coming tuner/crew chief, Rex Hutchinson: Reference manual extraordinaire, Dave Cooper and Reader: Instant crew/hauler/shop and everyone that acknowledged we have a bad ride. Knight: Yes, Thank you to everyone for your help & support. Look for the NITRO CHARGER at a racetrack near you soon. BE THERE BE THERE!! Fast Lane Summer is the new documentary that follows the Foothill Flyer and the Free Mexican Airforce during their racing and non racing exploits. It is scheduled to debut at a showing in New York on May 5th. 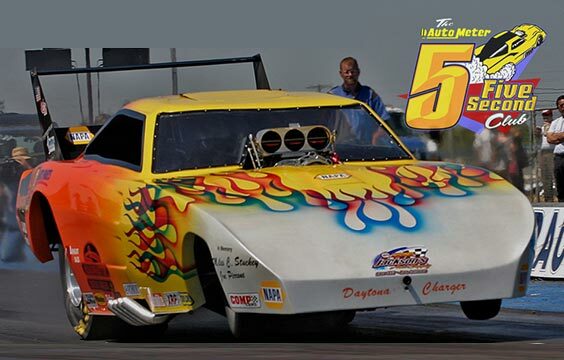 Click Here to buy tickets and support Nostalgia Drag Racing. Check out these shots from Mike Bieke that span 1979 through 1986. These are some great shots and Mike has said that he will be sending us more in the future. Prints are available from the shots we have posted and those that will be posted in the future. Just email Mike at the email addy on the gallery page. Thanks Mike! Sunny skies and warm temperatures greeted racers and fans at Southwestern International Raceway in Tucson AZ this weekend for the Inaugural Old Tucson Dragway Reunion. Qualifying for Nostalgia Funny Car, NE I, and Hot Rod II began in the late afternoon for the NE I and Hot Rod II class Friday. Nostalgia Funny Car ran their first round of qualifying under the lights around 7 pm. 13 Nostalgia Funny Cars showed up for this event, which is the largest showing of Nostalgia Funny Cars to date, with the exception of last months ill fated March Meet. Kris Krabill was the top of the class Friday evening during both qualifying sessions with a very nice pass of 6.238 @ 223.25. Sean Dale was #2 with a 6.505 @ 208.81. The track went cold after Mike Adams broke the rear end in his flopper dropping synthetic gear oil down the length of the track. After the track was cleaned the temp had dropped to the point that nobody could get make it down the track. With that turn of events, it was decided to run an extra qualifying session Saturday morning. Dennis La Charite took over the #1 Qualifier was a great pass of 6.222 @ 234.74. Dan Horan was able to bump his way into the show with a pass of 6.363 @ 222.95. Mike Savage and Randy Walls were also able to bump their way into the show, and in the process putting Tryon, Schwarz, Maroney, and Utterback out of the show. In an unfortunate turn of events, Randy Walls was DQed from running in eliminations due to his 3 speed transmission. It is a requirement that any flopper running in any event put on by the Nostalgia Funny Car Association and the Nostalgia Funny Car Tour that you be in compliance with VRA rules, as is stated on the entry form that the racers sent in. As I am not privy to all of the facts in this matter, I will leave it at that until more information can be obtained. Steve Tryon was then reinstated into the field for eliminations. Prior to the start of eliminations and exhibition passes, there was the Hall of Fame induction ceremony for some of the all time great racers from Old Tucson Dragways past. The inductees were Frank Townsend, Leo Toia, Donny Toia Sr., Kevin Rotty, Joe Pierce, Carl Grimes, Jim Stewart, Jim Estus, and Lefty Little. Congratulations to all of the 2006 Hall of Fame Inductees. Click here for Hall of Fame Inductee photos. First round of Nostalgia Funny Car action saw Sean Dale defeat Dennis La Charite with a 6.573 @198.15 to the losing La Charite's 6.856 @ 165.09. La Charite got loose on the top end and barely missed hitting the wall. Mike Adams defeated Steve Tryon with a 6.443 @ 205.82, when Tryon broke on the burnout. Dan Horan Jr. defeated Bob Godfrey with a 6.432 @ 217.95 to the trailing Godfrey's 6.672 @ 193.38. Kris Krabill defeated Mike Savage with a 6.322 @ 219.47 to Savage's 6.404 @ 215.55. Round 2 of eliminations saw Sean Dale defeat Dan Horan Jr. with a 6.504 @ 208.49 to Horans skating 8.097 @ 123.46. Kris Krabill defeated Mike Adams with a 6.301 @ 218.02 to Adams losing time of 6.478 @ 210.44. In the controversial final round Kris Krabill defeated Sean Dale with an up in smoke on and off the throttle 7.538 @ 150.92 after Dale was DQed for an extensive delay in staging his flopper. Fortunately there was video of the staging duel that showed that from the time Krabill turned on the stage light till the time the starter turned on the red in Dale's lane was 11 seconds. @ 194.04. Rick White had a best time of 6.247 @ 233.12. Adam Sorokin had a best time of 6.270 @ 235.56. John Rowley had a best time of 7.259 @ 183.77. Dan Rusk had a best time of 7.391 @ 178.64. In the AA/Gasser Class Dale Boomgaarden led the field with a 6.971 @ 198.58. Chuck Moore posted a best of 7.018 @ 196.73. Cecil Mathews posted a best of 7.412 @ 188.20. Chris Ribeau posted a best of 8.133 @ 167.99. Dan Levitt Jr. took the NE I Class Crown and Denny Parker won in the Hot Rod II Class. Mack Mc Cord made one exhibition pass on Saturday with a time of 8.519 @ 100.05. 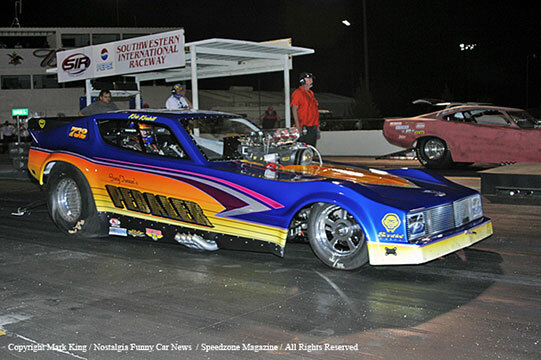 Jeff "Killah" Utterback will return to shoe Jeff Gaynor's "Hard Times" Challenger bodied Nostalgia Funny Car at the Old Tucson Dragway Reunion next weekend at Southwestern International Raceway in Tucson AZ. Tucson Arizona's Southwestern International Raceway will host the Inaugural Old Tucson Dragway Reunion April 7th and 8th. There will be Nostalgia Funny Car qualifying under the lights Friday Night! Nostalgia Funny Cars expected to attend include Larry Pettit, Mike Savage, Dan Horan Jr, Mike Adams, Nate Bugg, Steve Tryon, Jeff Gaynor, Bob Godfrey, John Powers, Dennis La Charite, Mark Stuckey, and Sean Dale. They will be qualifying for an 8 car field with eliminations set for Saturday. Gates open Friday afternoon at 4 PM and Saturday morning at 8 AM. Tickets are $10.00 Friday with kids 5 and under free, and $20.00 Saturday with kids 5 and under free. This is one Nostalgia Funny Car Event you won't want to miss! Mike Adams race shop in Phoenix AZ, was burglarized sometime last night. Stolen were toolboxes, power tools, radios, and other miscellaneous racing related items. 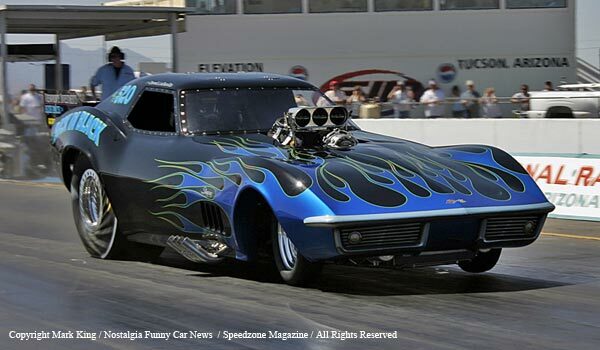 This is a big hit for Adams, who is scheduled to compete at next weekends Old Tucson Dragway Reunion. 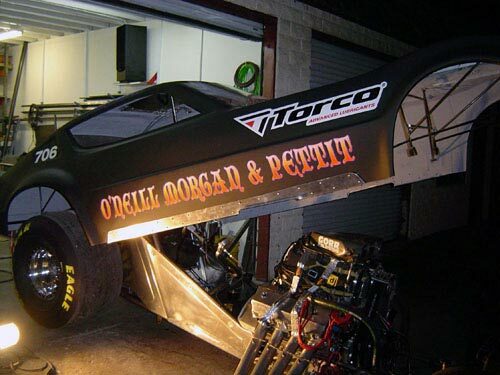 John Power's second Trans Am bodied Nostalgia Funny Car is currently being put together in CA. Ron Fassl is said to be the new shoe for Power's second flopper. Fassl who was injured in Denver last year in his AA/FA is ready to get behind the butterflies for the first time since his accident in Power's new flopper soon. Pro Racing Fuels was served with a temporary restraining order signed by a US District Court Judge yesterday. The restraining order forces Pro Racing Fuels to discontinue the use of their current logo only. It does not have any impact on Pro Racing Fuels ability to distribute fuels. This is just the latest move in the Pro Nitro VS Pro Racing Fuels feud. Pro Racing Fuels is currently in process of getting new logos placed on all of the merchandise and support vehicles. Pro Racing Fuels remains the Official Fuel Distributor of the Goodguys Nostalgia Racing Series and will have fuel available at all events this season according to Jim Mc Monagle of Pro Racing Fuels. out drive and is fearless. And how about Jenna Lucy? She has been running a super comp car and has been under "Fast Jack" Beckmans tutelage for awhile now. She could be another candidate. I know it takes money to run these cars, but think of the marketing and sponsorship opportunities that the ladies bring to the table. As far as body's go, a serious can of worms was opened up last week. Unless you live on another planet, you know that Goodguys capitulated to John Powers and his lawyers over allowing Powers to run his radically modified Trans Am body's. My take on the whole situation is this. I am disappointed with the Goodguys decision. I understand that they didn't want to spend the money to fight it, but it is still a disappointing decision. I don't think that Powers flopper bodies are built to the spirit of the rules. Everybody building these cars has a responsibility to maintain period correctness as closely as possible in my book. Those that insist upon building these late model replicas and non period correct flopper bodies don't have the classes best interest at heart and will eventually kill the class. Rheel, Hansen, and Utterback have already gone on record saying that they will build something just as outrageous as Powers modifications. The genie is out of the bottle and it is going to be a hell of a fight to put the genie back. I don't have a problem with racers wanting to run 80's style bodies. I just don't want to see them represented as Nostalgia Funny Cars. Start an 80's class of floppers and run them as such. Batmobile's have no place in the current Nostalgia class. I don't understand the current thinking on bodies such as these. These cars don't run sufficient speeds for the aero to be of any help. So, why build them to compete in a class they don't belong in? Of course you have the "Chicken Little" crowd out there screaming from the tops of their lungs "THE SKY IS FALLING, THE SKY IS FALLING"! This is the end of the road for the class. Well, I don't see it that way. You have about 20 other racers out there that are racing within the spirit of the body rules. I refuse to throw the whole class under the bus because of one decision that I don't agree with. One parting comment before I move one. What if Powers made his point with his legal action and shows up in Pomona in a couple of weeks with a VRA legal body? Then what will all of his critics say? At the recently completed Old Tucson Dragway Reunion we had an unfortunate incident in the final round. Sean Dale was counted out and given the red eye in his final round match up against Kris Krabill. This is the kind of situation that if allowed to continue unchecked, will cause some major problems for the class. Nobody pays to see somebody disqualified in the final round of any race. If I was a spectator and paid to see that, I would be pissed off in a big way. This was a black eye for the show in my opinion, and something that could cause the class to look bad to spectators, sponsors, and promoters alike. I am not pointing any fingers at anybody. This is just the latest occurence. All I am saying is that there should be mutual respect shown between the racers on the track during the staging process. If your flopper has a problem and fires late, do a shorter burnout to keep from holding the other guy sitting for too long. When you prestage, be ready to light the bottom light, stab it, and GO. It will make for a much better show for the fans, sponsors, and promoters. Phoenix Apparel has been contracted by Nostalgia Funny Car News to manufacture the prestigious Auto Meter AA/FC 5 Second Club Jackets. To see the rendering of the jacket. Check out Lil' Nates new blog on their web site. Clutch Girl has just posted the first installment. When it rains in Bakersfield, it pours, for days at a time. The rescheduled March Meet got off to a very rocky start when it rained off and on all day on Friday. The evening saw thunderstorms that sent torrents of rain on Famoso Raceway. The rain continued off and on all night long, at times raining heavily. Saturday morning started with drizzle and tapered off to partly cloudy skies. Just before the track officials were ready to start sending cars down the track, another downpour washed out the racing surface yet again. Finally around 4:30 pm the Pro Racing Fuels Nostalgia Funny Car Class made its appearance. Unfortunately, Nate Bugg in his 'Lil Nate flopper breaks on the burnout and oils down the track. By the time the cleanup is complete it is 5:30 pm and the track is bone cold. I saw one person on the track checking the condition do a spin on one leg in the groove about 30 ft past the starting line. Definitely not a good sign, but the call went out to run them. Bob Godfrey and his new Camaro flopper and Dennis La Charite are the first pair up. Neither flopper is able to get down the track. Larry Pettit in his brand new Arrow flopper and Stephen Romanazzi are the next pair up and it gets ugly very quickly. After a hard launch, Larry Pettit short shifts and his flopper makes a hard right turn. Before he can get a handle on his flopper, Pettit crosses over into Romanazzi's lane. Fortunately Romanazzi was past Pettit at the time. What makes this even more fortunate is that Romanazzi was the only flopper to make a full pass under power. If Pettit had been paired up with any other car in this session, the end result could have been catastrophic. Romanazzi ends up posting a time of 6.405 @ 217.91 to take the number 1 position. The rest of the round was more of the same. On and off throttle, sashaying passes that were in the 8 to 10 second range. Dan Horan on his qualifying attempt came very close to the wall on the top end. 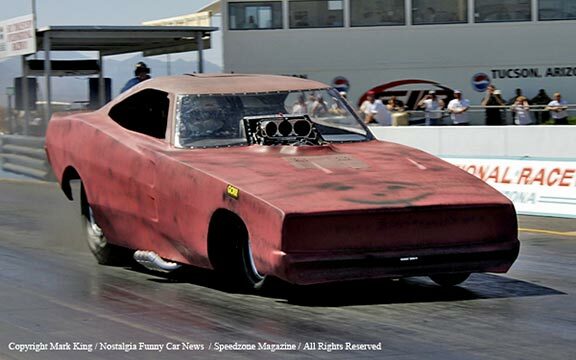 Sean Dale made his first appearance with his Dodge Charger bodied flopper, but was shut off after the burnout. Jeff "Killah" Utterback made his return to the drivers seat in Mark Stuckey's "Nitro Charger" flopper. This is the first time the Nitro Charger has seen the track in a couple of years. The Rocky Pirrone paint on the flopper has remained largely intact. The Superbird is still sporting its unique wing as well. Kris Krabill made his racing debut in Gary Turners "Pedaler" flopper. Steve Tryon also debuted his "Sun Devil Hustler" Mini Satellite flopper. Danny Pisano were on the property for tech purposes and to show. Losing the March Meet brings the race schedule for the points chase down to the 3 events left on the schedule, as no points or payouts are to be awarded. The March Meet was a no win situation for everybody involved this year, and that is the biggest shame of all. Pro Racing Fuels LLC has been named the Official Fuel Distributor for the Goodguys Racing Series. Pro Racing Fuels LLC will be the sponsor for the Nostalgia Funny Car Class and the the A/Fuel Class this season. Pro Racing Fuels LLC will also provide contingency awards to the AA/FD Class Winner and Runner up. Pro Racing Fuels LLC will also provide contingency awards for all gasoline and methanol categories as well. Contestants for contingency awards must have proof of purchase receipts and Pro Racing Fuels stickers on both sides of their race car. Pro Racing Fuels is in no way affiliated with Pro Nitro LLC, or its members. Pro Racing Fuels LLC will provide the following fuels to the Goodguys Racing Series this season. Racers using nitromethane products must have a security I.D. sheet on file no exception. We look forward to serving you, our customers in the coming months with all of the quality racing fuels you need. If you would like to place an order, or have any questions, you may contact us at the number below. Bakersfield, CA 3/9/06 - The Goodguys 47th March Meet presented by Clay Smith Cams, originally scheduled for this weekend, has been postponed one week and will be run the weekend of March 17, 18 & 19 at Auto Club Famoso Raceway just north of Bakersfield.. 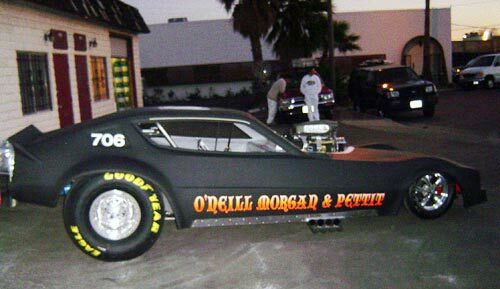 Check out these updated photos of Pettit's Arrow Flopper by Steve's Paint and Airbrush, of the Morgan, O'Neill, and Pettit Nostalgia Funny Car. Here are some updated photos of Larry Pettit's Arrow Flopper that will be at the March Meet next weekend. The flopper will be in primer and lettered by Steve's Custom Paint and Airbrush. 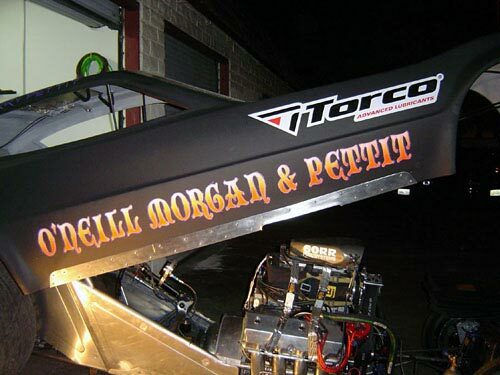 Tommy Thompson, son of Junior Thompson, has done much of the fabricating on the O'Neill, Morgan, and Pettit Arrow Flopper. I cant wait to see the final paint on this flopper when Steve gets done. It is going to be a beauty. Thanks to Steve and Larry Pettit for updating us with these pictures. 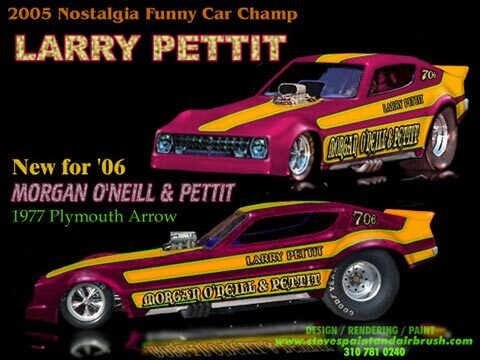 This is the first look at the Morgan, O'Neill, and Pettit artwork rendering for their 77 Plymouth Arrow Nostalgia Funny Car. Rendering and upcoming paint is by Steve's Paint and Airbrush. Orange, CA - The 47th annual March Meet event presented by Clay Smith Cams will showcase over 500 1972 and earlier vintage cars and racers at Auto Club Famoso Raceway this weekend in Bakersfield, California. It will be the season opener for the GoodGuys nostalgia drag racing series, the biggest race of the year and it marks the Lil Nate Nostalgia Funny Car team’s ninth consecutive appearance. 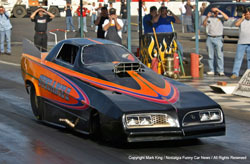 Nostalgia Funny Car News would like to welcome our newest partners in the Nostalgia Funny Car Class. 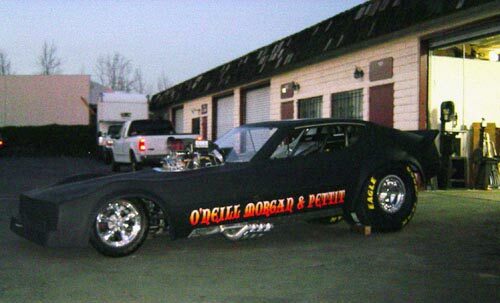 Gorr Fuel Systems and Pro Racing Fuels are now onboard and we are pleased that they have joined us in promoting Nostalgia Funny Cars. You can click on the link to the left to get to Gorr Fuel Systems website. If you need nitro or any other racing fuel you can contact Pro Racing Fuels at (775) 690 - 3488. 2/21 - Famoso and SIR To Host Test N Tunes This Weekend. Famoso has once again opened its gates up to the nostalgia community for a weekend of testing this weekend. Southwestern International Raceway will also host a one day test session for NFC's. Scheduled for SIR testing is Mike Savage, Mike Adams, Steve Tryon, and Sean Dale. 2/21 - No Nostalgia Funny Cars At Last Weekends Famoso Test Session. There were no Nostalgia Funny Cars at last weekends Famoso Test N Tune. Larry Pettit is planning on making this weekends test session at Famoso, and hopefully we will see some other NFC's out as well. Southwestern International Raceway will host the Old Tucson Dragway Reunion April 7th and 8th. There will be a field of Blown Nitro Nostalgia Funny Cars along with a field of Nostalgia Top Fuel. Wes Close, the tuner on the Godfrey and Close "Flamed Fortune" Nostalgia Funny Car has updated us with some pictures and info on their new flopper that they will campaign this season. 2/13 - Famoso To Host Nostalgia Test N Tune February 17th and 18th. Famoso is set to host their first Test N Tune this coming weekend in Bakersfield CA. Reigning Goodguys Champ Larry Pettit is tentatively scheduled to be in attendance to shakedown his new Plymouth Arrow flopper. Spike Gorr of Gorr Fuel Systems is also tentatively scheduled to be on hand as well. Pete Gemarr was on hand at Southwestern International Raceway last Saturday when Mike Savage and Jim Broome made a couple of test passes prior to heading up to Speedworld on Sunday. os. Jim Broome and Mike Adams have rented the track at SIR for Saturday February 25th. Those slated to show up are Mike Adams, Jim Broome, Steve Tryon, and Sean Dale. If you are interested in taking your altered, dragster, or flopper down for this test session, contact us. Speedworld Raceway Park is set to host the Inaugural "Nostalgia Shakedown" Test N Tune, February 4th and 5th, 2006. NFC's already confirmed to show are Mike Savage in Jim Broome's Speed Sport Cuda, John Powers in his Sundance II Trans Am, Mike Adams in his GCG Corvette, and Steve Tryon in his freshly painted Bad Company Mini Satellite. Also included in the Nostalgia Shakedown will be AA/FD's and AA/FA's. The track will be fully prepped each day prior to test passes. Admission for Nostalgia Racers and Crew is $50.00 a day. Larry Westerveldt from Goodguys disallowed John Power's new Trans Am flopper from competition late yesterday afternoon. First look at John Power's new Trans Am flopper during a test session this weekend at Speedworld Raceway Park in Phoenix AZ. John Powers latest flopper is a beautiful piece of craftsmanship. The lines are clean, and the graphics and paint are top notch. The Trans Am body was originally a Donnie Reeves body, that has undergone extensive modifications. 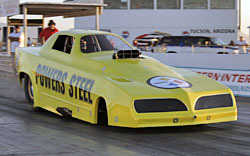 Though it might offend the nostalgia funny car purist, it has been built within VRA rules, according to Powers. After the passing of Dan Geare, John Powers hired Frank "Rootbeer" Hedges and his Mastercam team to tune and maintain his new flopper. They are still working out the bugs on this beautiful flopper and plan on testing extensively in hopes of making the March Meet. This past weekend was spent making short shutoff passes. First look at John Power's new Trans Am flopper during a test session today at Speedworld Raceway Park in Phoenix AZ. Bakersfield, CA - Don Garlits is returning to Bakersfield this spring. The winningest top fuel racer in March Meet history, “Big Daddy” will be honored by the Goodguys Vintage Drag Racing Association as the official “Hot Rod Hero” of the 47th March Meet presented Clay Smith Cams. The three-day event, scheduled for March 10-12 will envelope Auto Club Famoso Raceway, just north of Bakersfield for three days of all out vintage drag racing and hot rodding fun. The event serves as the first stop of the 5-race 2006 Goodguys West Coast Championship Series. Garlits, winner of five March Meet top fuel titles during his historic career, will be on hand all three days signing autographs for fans, selling merchandise and will even make an exhibition run or two behind the wheel of his restored “Swamp Rat 1B” blown fuel Chrysler powered dragster. Garlits’ wife Pat and longtime friend and crewman “T.C” Lemmons will attend the event as well. The 47th March Meet will feature over 500 1972 & earlier race cars competing in 14 classes highlighted by front engined top fuel dragsters and nostalgia funny cars. The event will also feature a rod & custom show & shine, a giant manufacturer’s midway, exhibition vehicles, and an automotive and racing swap meet. It has come to our attention that Las Vegas Motor Speedway is not allowing NFC's on their property at all for the Nitro Blast Off and that Firebird Raceway in Phoenix will only allow them on the property on the Monday following. Oh, and only if they are willing to part with $500.00 bucks to test for the day. LVMS will allow NFC's to test at their last chance test session in February. Check out the update photos on Dale Smith's NFC.